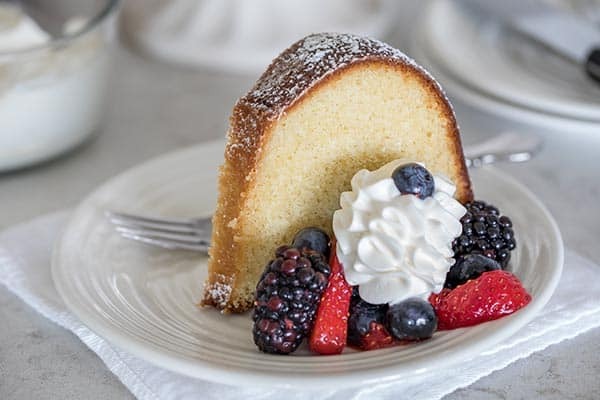 This Classic Vanilla Bundt Cake may be the perfect vanilla bundt cake. It’s tender and moist, slices beautifully, and has a vanilla glaze drizzled over it while it’s warm so it gets a sweet sugar crust on the outside of the cake. King Arthur Flour has declared 2017 the year of the bundt. They’re encouraging everyone to bake along with them. Earlier in the year I baked their Lemon Bliss Cake (which is a must try if you’re a lemon lover.) 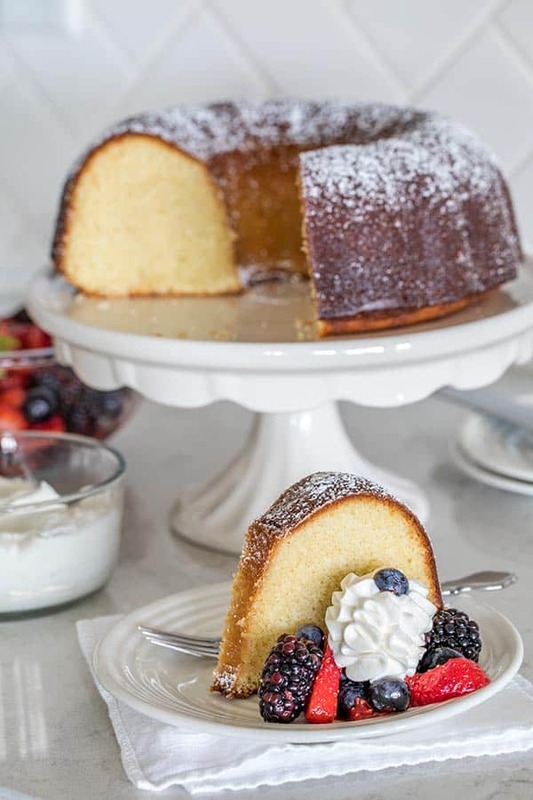 Today I’m sharing my high altitude version of their Classic Vanilla Bundt Cake. Don’t be afraid of changing a recipe if you live at high altitude, it’s actually easy to do and a few simple changes can make a big change in the end result. I used King Arthur Flour’s high altitude baking guide to convert the cake to my altitude. We moved this year and now live at about 5,000 feet. I don’t always adjust for altitude when baking, but I always do when baking cakes from scratch. The directions for mixing this cake are a little unusual. It just takes a few minutes longer to mix it this way. But the batter was so silky and light when I poured it into the bundt pan. I was super impressed. When I sliced the cake I was also super impressed. Inside the cake was moist and tender, but the slices held together beautifully. Each slice stood up perfectly on the plate. If you don’t live at high altitude, use the Classic Vanilla Bundt Cake recipe on the King Arthur Flour site. Because if you’re a vanilla lover, you’re definitely going to want to bake this cake. Place the butter and sugar in a large mixing bowl. Beat together at medium speed until the mixture lightens in color and looks fluffy. Scrape the sides and bottom of the bowl. Add the baking powder and salt, mixing just to combine. Weigh out the flour, or measure it by gently spooning it into a measuring cup, sweeping off any excess with a straight edge. Set it aside. With the mixer running at medium speed, add the first three eggs to the butter/sugar mixture one at a time. Wait until each egg is absorbed into the mixture before adding the next. Add 2 tablespoons of the measured flour to the bowl after the third egg, and mix until combined. Add the fourth egg, mix until absorbed, then mix in another 2 tablespoons of flour. Continue in this fashion with the fifth and sixth eggs, alternating the addition of the egg with 2 tablespoons of the flour from the recipe. Add the vanilla (or vanilla bean paste) and almond extract (if using) to the milk. Add one-third of the remaining flour to the batter, beating gently to combine. Gently beat in half the milk. Mix in another third of the flour, then the remaining milk. Stir in the remaining flour. Scrape the sides and bottom of the bowl, then beat until the batter is smooth and fluffy, about 20 to 30 seconds at medium-high speed. Thoroughly grease a 10- to 12-cup Bundt pan, using non-stick vegetable oil spray or shortening (not butter; butter tends to increase sticking). Scoop the batter into the prepared pan, smoothing the top with a spatula. Bake the cake for 50 to 60 minutes, until it's starting to brown, appears set on top, and a toothpick or long skewer inserted into the center comes out clean. (If you're baking in a dark-interior pan, start checking at 45 minutes.) If the cake appears to be browning too quickly, tent it with foil for the final 15 minutes of baking. Remove the cake from the oven, and gently loosen its edges using a heatproof spatula. Turn the pan over onto a cooling rack. After 10 minutes, lift the pan off the cake, and allow it to cool completely. While the cake is cooling in the pan, make the vanilla syrup. Combine the sugar, water, and salt. Heat briefly, just to dissolve the sugar; a microwave works fine. Stir in the vanilla. Once you've turned the cake out of the pan onto a rack to cool, gently brush it all over with the glaze. Just before serving, sift a shower of confectioners' sugar over the top, if desired. A garnish of fresh berries is lovely and tasty. Store leftover cake, well wrapped, at room temperature for several days. Freeze for longer storage. Do you have any eggless version of reciepe for vanilla cake like the ones you have for chocolate cake? I haven’t tried a vanilla version of the eggless cake, but you could try substituting 1/2 cup of additional flour instead of the cocoa https://www.barbarabakes.com/old-fashioned-chocolate-cake-with-maraschino-cherry-filling/ Let me know if you try it. This looks delicious! I am planning on making it the evening before a party. Should i put the glaze on the night before, or wait until right before the party? Hi Sue – this is perfect for a party. The glaze mostly gets absorbed by the cake, so it’s alright to glaze it the night before. Enjoy! I love that this is a high altitude bundt cake mum as I’ve experienced high altitude and it really does change things! Did you really have to adjust to the altitude? That is one gorgeous Bundt cake. I have quite a few different Bundt pans and will admit I don’t use them as often as I used to…probably because there’s just 2 of us here now. I know I could cut it up and freeze it but…..they’re just so pretty sitting on my glass covered cake stand. 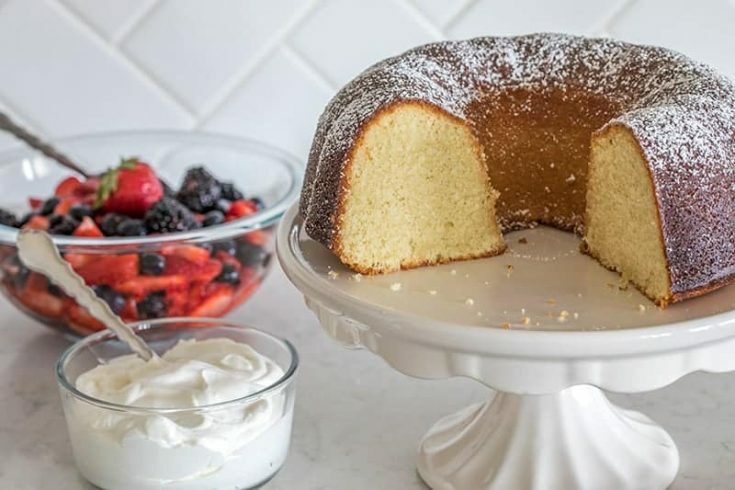 I do love a classic vanilla cake as much as I love a chocolate one-and I especially love Bundt cakes because I’m not much of a frosting lover. I’m lucky enough to be within a few hours of King Arthur Flour-my daughter lives even closer and has gone before and loved it. It’s quite the place from what she told me-so many nifty things to buy in their store too….oh goodness the temptation!